Home » Collier Edition » DO I HAVE AGING FRAILTY? WHAT IS AGING FRAILTY? DO I HAVE AGING FRAILTY? WHAT IS AGING FRAILTY? Frailty is a very common and important condition affecting individuals over 65 years old. It is an important geriatric syndrome that is characterized by age-associated decline on physiologic reserves and function across many organ systems. This leads to vulnerability and to adverse health outcomes such as when they are exposed to stressors like acute or chronic illnesses such as a heart attack, a new drug, minor infection, or conditions produced in situations like surgery. Frail patients are at risk for marked and often disproportionate decompensation, adverse advanced complications from procedures, prolonged and slow recovery, functional decline, disability, and an increased risk of dying. The proposed factors for this condition include chronic state of inflammation, hormonal dysfunction, neuropsychological impairment, cardiac and cerebrovascular disease, and malnutrition. Individuals who are suffering from frailty, the muscle breakdown exceeds muscle building and this leads to a steady and progressive decline in muscle mass and strength called sarcopenia. Under stress conditions, these impairments are unmasked and a vicious cycle settles with physical inactivity and malnutrition leading to further decline. The manifestation of frailty can present as many signs and symptoms, which varies from a mild to severe degree among individuals. 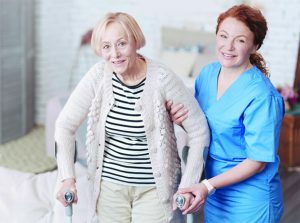 Common clinical indicators of frailty are muscle wasting, fatigue, weakness, exhaustion, poor endurance, low physical activity, poor balance, abnormal gait, slow gait speed, falls, poor appetite, malnutrition, weight loss, and cachexia. Improving mobility and physical functionality can result in improvement in other associated signs and symptoms. Trends in population demographics show that the population is living longer and requiring more medical and health-related care in services than previously needed. This results in a tremendous economic pressure. The overall incidence of frailty in the population of patients 65 years of age or older is about 10% and affects up to onefourth to one-third of individuals over the age of 80. There have been multiple instruments developed in order to determine which individuals are suffering from this geriatric syndrome and there are objective measures that can be tested to determine if an individual is suffering from frailty. In 2013, many experts from six different international societies published a consensus statement defining frailty as a medical syndrome with multiple causes and contributors that are characterized by diminished strength, endurance, and reduced physiologic function that increases individual vulnerability for developing increased dependency or death. These experts further agree that frailty is a treatable condition and that simple rapid screening tests can be used to allow physicians to recognize frail persons. Among these rapid screening tools recommended was the Canadian Study of Health and Aging instrument known as the Clinical Frailty Scale, or CFS, which is measured based on clinical judgment. Assessment and treatment are focused primarily on changes in strength, balance, and mobility using well-accepted measures of treatment benefits that include 6MWT, SPPB, and handgrip strength. These tests are valid, sensitive to change, and known predictors of adverse outcomes often experienced by patients with aging frailty. Improvement in these physical performance measures will indicate improved functionality, a decline in frailty, and decreased likelihood for poor clinical outcome. Inflammation may play a direct role in the development of disability due to the effects that inflammatory enzymes may have on muscles. Accelerated decline of muscle mass and strength with aging is probably one of the major causes of disability late in life and a prevalent characteristic in physical frailty. Many studies have shown that inflammation has been associated with increased mortality in elderly persons and may accelerate progression of medical conditions that result in functional decline and disability. The overall prevalence of frailty in communitydwelling older adults, age 65 or older, range between 7-12%. This increases with age and can be up to 25% in individuals 85 years or older. In the Women’s Health and Aging Study (WHAS), the prevalence of frailty was 11.3%. Weakness, slow gait, and low physical activity were the most common initial manifestations of frailty. At this moment, multiple studies are being performed to treat, evaluate, and prevent aging frailty. Stem cells have been shown to be promising and is being used to fight the inflammation that is believed to cause frailty. In individuals, stem cell production decreases with age and this decrease likely contributes to the reduced ability to regenerate and repair organs and systems and fight inflammation. At this moment, stem cells are being studied to determine whether intervention with stem cells has a benefit on functional mobility and exercise tolerance compared to a placebo in patients with aging frailty. For more information on these types of studies, please call Advanced Research for Health Improvement in Collier County.